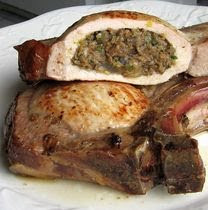 This stuffed pork chops recipe is typical of the type of finely chopped vegetable stuffing Eastern Europeans love. Mushrooms, onions, celery, parsley and toasted bread crumbs are the only ingedients -- no broth, no eggs. The chops are browned on the stovetop, then baked in the oven. Here's a larger picture of stuffed pork chops. In a large skillet, melt butter and saute onion, mushrooms and celery until cooked and most of the juices have evaporated. Add parsley and bread crumbs and mix well. Let cool. Meanwhile, Wash and pat dry chops. Using a boning knife, make a 1-inch slit in the center of each side. Using the knife, widen the pocket but leave the opening only 1-inch wide. Heat oven to 375 degrees. Stuff the pork chops until they are nice and plump. You will probably have leftover stuffing. Season both sides of chops with salt and pepper and sear in a nonstick pan until nicely browned. Place chops in a shallow baking dish and surround with any leftover stuffing. Add 1/4 cup water or stock and bake, uncovered, about 30 to 35 minutes or until internal temperature registers 150 degrees. Serve with pan juices, if desired. Sauerkraut and Apples would go well with this dish.